Microdermabrasion provides immediate and visible results for ageing skin, lines and wrinkles, open pores, blackheads, pigmentation, blemish scars, acne scars, stretch marks and so much more. 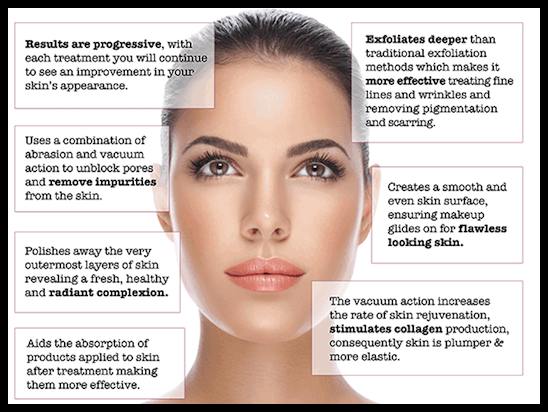 You’ll see the difference after just one treatment, more problematic skin, however, may require a course of treatments. When time is short go express treatment begins with a foot ritual, Facial cleanse, Microdermabrasion throughout face and targeting area’s of concern,tone, eye rejuvenation, mini neck and shoulder massage and SPF moisturiser to finish. If time isn’t an issue. Go Luxury, effective results. A wand delivering a fine jet of abrasive crystals is passed over the skin. Dead skin particles are be abraded away and a vacuum action will remove the debris. This dual action will both resurface the skin and stimulate the blood flow, encouraging the skin to rejuvenate itself and produce collagen and elastin. After passing across the skin area once, the therapist will then target problems areas like open pores, pigmentation, fine lines, wrinkles, blemishes and acne scarring. Payments for courses can be paid into two installments. You may also have your first facial and decide to have it as part of your course.